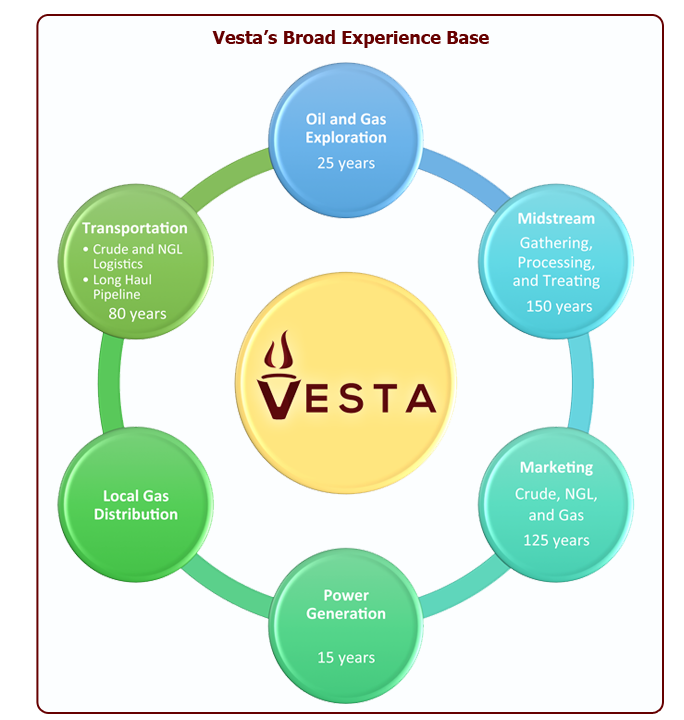 The Vesta management team is comprised of experienced individuals with extensive executive and management histories that span all sectors of the oil and gas industry. This broad and seasoned experience base enables the company to effectively meet the needs and challenges of today's energy producers. Effective relationships are built upon trust, communication and responsiveness. Vesta strives to understand producer needs and to be an important resource tool for producers. Mr. Davis possesses an extensive background in executive management of oil and gas companies with particular emphasis on business development, project financings and financial management. His past experience includes all midstream activities including natural gas contracting, gathering, system construction and crude oil sales. Mr. Gifford has extensive executive management experience within the midstream sector, including regulated and unregulated gas gathering, processing and interstate transmission businesses. With a background in engineering, Mr. Gifford held various positions for 35 years at DCP Midstream or its predecessor companies, including officer level positions responsible for project development, commercial and operations functions for more than 20 years. Ms. Branch has extensive executive management experience having held key management positions in both privately held and public traded energy companies. An attorney, her professional experience includes project development and management, legal work associated with complex transactions, and operational experience with most sectors of the energy industry. Mr. Mirc leads the corporate development efforts for Vesta and has commercial experience in gas gathering, processing, NGL marketing as well as project development and corporate analysis. Prior to joining Vesta, he was a commercial manager for DCP Midstream for Western Midcontinent assets. He is a licensed Professional Engineer in the State of Colorado and holds a bachelors degree in Mechanical Engineering from the University of Nevada and an MBA from the University of Colorado. Ms. Miller has over thirty-five years of experience in the oil and gas industry. She has managed marketing efforts with several oil and gas companies, where her chief responsibilities were the maximization of company production and insuring the uninterrupted movement of production through reliable transportation arrangements with gathering and pipeline companies. Mr. McCarty has over 35 years experience in the Exploration/Production and Midstream segments of the energy industry. Before joining the company, he was Sr Director-Accounting at DCP Midstream responsible for the companies Gathering and Processing accounting, Division Orders, System Support and Regulatory Reporting functions.